1. Is Schedule D the Same for a 1040 and a 1041? Amid the grief that results from someone’s death, the unenviable task of handling business affairs falls to the decedent’s fiduciary. A fiduciary is a representative who may be the estate’s executor (also known as a personal representative in some states), administrator (court-appointed if the person died without a will) or trustee. One important task of a fiduciary is filing IRS Form 1041 (U.S. Income Tax Return for Estates and Trusts) for the estate by the filing due date. The fiduciary may also have to include an additional tax document – IRS Form 1041 Schedule D – to report any capital gains or losses for the decedent's estate. At death, a person's assets become the property of the decedent’s estate. And if any of the estate’s assets generate income, that income also becomes property of the estate. For tax purposes, the IRS defines two types of estate assets. The “estate tax” is imposed on a decedent’s assets that are transferred to the heirs and beneficiaries. The “income tax” is imposed on the income that the decedent’s assets generate. Examples of income-generating assets include stocks, mutual funds and rental property. If an estate produces more than $600 in annual gross income, the fiduciary must file IRS Form 1041. The estate’s (or trust’s) income, deductions, gains and losses. The estate’s accumulated income, income that’s being held for future distribution or income that currently is being distributed to the estate’s beneficiaries. The estate’s income tax liability. Employment taxes from wages paid to household employees. After reporting these items, fiduciaries must also determine if they need to file Schedule D as an attachment to Form 1041. Capital gains and losses from the transactions reported on IRS Form 8949 (Sales and Other Dispositions of Capital Assets). Certain transactions (explained in Form 8949) that the estate or trust is not required to report on Form 8949. For example, you don't have to include transactions that were reported on Form 1099-B (Proceeds from Broker and Barter Exchange Transactions) that have already been reported to the IRS without needing any adjustments. Gains reported on Form 4797 (Sales of Business Property), Part I. Capital gains or losses reported on Form 4684 (Casualties and Thefts). Capital gains or losses reported on Form 6252 (Installment Sale Income). Capital gains or losses reported on Form 6781 (Gains and Losses from Section 1256 Contracts and Straddles). Capital gains or losses reported on Form 8824 (Like-Kind Exchanges). Undistributed long-term capital gains from Form 2439 (Notice to Shareholder of Undistributed Long-Term Capital Gains). Capital gains or losses from other estates or trusts, partnerships or S corporations. For the 2018 tax year, any capital loss carryovers from tax year 2017 to tax year 2018. Form 1041 Schedule D is a 45-line form that spans two pages. But the instructions for this form are far lengthier. The IRS provides 12 pages of these directions to help taxpayers with step-by-step instruction, worksheets, definitions and other resources. You’ll find Form 1041, Form 1041 Schedule D and the instructions at IRS.gov/forms. When you perform a document search at IRS.gov/forms, make sure to enter "Form 1041 Schedule D." Otherwise, you may pull up Form 1040's Schedule D. These two Schedule D forms look similar at first glance, but they contain different information for reporting on different tax returns. Lines 1 through 7 comprise the worksheet in Part I, which begins with a chart. This chart (Lines 1 through 3) helps you figure certain transactions you report on forms 8949 and 1099-B. Line 4 includes the total of certain short-term capital gains and losses you may have as reported on four separate forms – 4684 (Casualties and Thefts), 6252 (Installment Sale Income), 6781 (Gains and Losses From Section 1256 Contracts) and 8824 (Like-Kind Exchanges). Line 5 is where you’ll enter any net short-term capital gains and losses from partnerships, S corporations and other estates and trusts. And Line 6 is where you’ll enter any short-term capital loss carryover. After entering your figures on Lines 1 through 6, Line 7 represents the net result of all these entries. Lines 8 through 16 comprise the worksheet in Part II, which begins with a similar chart as you worked in Part I. The primary difference is that Part I calculates your short-term capital gains and losses, compared to Part II, which calculates your long-term capital gains and losses. The chart in Part II, just like the chart in Part I, also helps you figure certain transactions you report on forms 8949 and 1099-B. Line 11 includes the total of certain long-term capital gains and losses you may have, according to the same four forms in Section I, with one addition – Form 2439 (Notice to Shareholder of Undistributed Long-Term Capital Gains). Line 12 is where you’ll enter any net long-term capital gains and losses from partnerships, S corporations and other estates and trusts. Enter capital distributions on Line 13. If you reported any sales of business property, enter the gain from Part 1 of Form 4797 on Line 14. And if you have any long-term capital loss carryover, enter this amount on Line 15. After entering your figures on Lines 8 through 15, Line 16 represents the combined net result of all these entries. Part III consists of a three-line chart that combines the data you entered in Parts I and II to calculate your net gains and losses totals for the tax year. In addition, you’ll also enter two more data sources into Section III: unrecaptured section 1250 gain and the 28 percent rate gain. After entering all the data according to the instructions for Part III, Line 19 reveals your total net gain or loss. The one line entry on Part IV first instructs you to compare the amount from Part III, Line 19, Column 3 and $3,000. Enter whichever amount is smaller on Line 20. This is also the amount that you’ll enter on Form 1041, Line 4 (or, if you’re filing for a trust, Form 990-T, Part I, Line 4C). Note: If the amount from Part III, Line 19, Column 3 is greater than $3,000 (or if the amount from Form 1041, Page 1, Line 22 [or Form 990-T, Line 38] is a loss), you'll have to complete the Capital Loss Carryover Worksheet, which you'll find in the instructions for Schedule D.
Lines 21 through 45 round out Schedule D, but you’ll only have to fill out this part of Schedule D if the amounts you entered on Lines 18a and 19 (Column 2) are both gains, or if you entered any amounts in Parts I or II that require entering on Form 1041, Line 2b(2) and the amount on Line 22 of Form 1041 is greater than zero. Part V also includes instructions for completing Schedule D Tax Worksheet, if your specific tax situation meets certain criteria, including 990-T trusts. Stock (in trade, inventory or property) that's held primarily to sell to customers. Property (real or depreciable) that's used in a trade or business, even if the property is fully depreciated. Some inventions, patents, models or designs (even if not patented), secret formulas or secret processes as defined in IRS Code Section 1221(a)(3). Certain copyrights and literary, musical or artistic compositions. IRS Code 1221(b)(3) outlines the exceptions to this rule. Accounts or notes receivable that were acquired for services rendered during the ordinary course of business or from the sale of inventoriable assets or property that had been held for sale to customers. Certain U.S. government publications that were not purchased at a public sale price. Certain "commodities derivative financial instruments," defined in IRS Code Section 1221(a)(6), that are held by a dealer. Certain hedging transactions, defined in IRS Code Section 1221(a)(7), which were entered into during the normal course of business. Supplies that are regularly used in a trade or business. Form 1041 Schedule D instructions offer more details, explanations and exceptions for capital assets. You can electronically file Form 1041, but you'll also have to file Schedule D (and any other applicable forms that are part of this return such as Form 8949) electronically. If you e-file, use IRS Form 8453-FE (U.S. Estate or Trust Declaration for an IRS e-File Return) or IRS Form 8879-F (IRS e-File Signature Authorization for Form 1041). If you're the fiduciary of an estate, it's important to note that the decedent and his estate are two separate taxable entities. You'll need to get a tax ID number for the estate, which you can obtain from the IRS at no cost by applying online, through the mail or by fax. The estate's tax ID number is also called an "employer identification number," or EIN. Visit IRS.gov and enter "How to Apply for an EIN" in the search box. If you apply for the EIN by mail, you're typically looking at a four-week processing time, but if you apply online, the EIN is issued immediately during your session time. If you're the fiduciary of a calendar year estate or trust, file IRS Form 1041 and Schedule(s) K-1 by April 15 of the following year (or on the next business day if the 15th falls on a weekend or federal holiday). 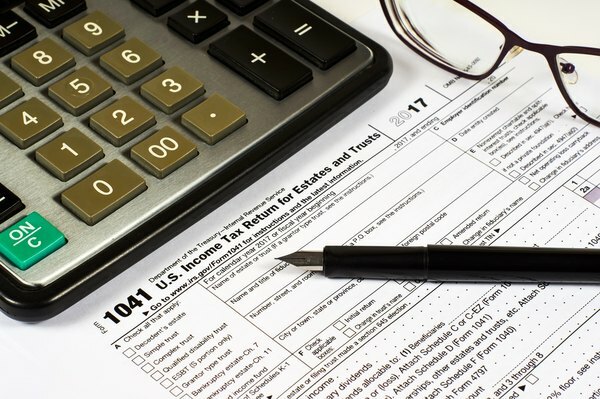 If you're the fiduciary of a fiscal year estate or trust, file Form 1041 by the 15th day of the fourth month following the end of the tax year. If you can't meet the tax filing deadline and you need more time to complete your Form 1041, the IRS gives you an automatic five-month extension – but you have to apply for this extension. Complete IRS Form 7004 (Application for Automatic Extension of Time to File Certain Business Income Tax, Information, and Other Returns), which you'll find by visiting IRS.gov/forms and searching by the form number. "What Does ""Long Term Capital Loss"" on Schedule D Mean?" What Are the Treatments for Nondividend Distributions on Schedule D?